German President Horst Koehler has agreed to dissolve parliament and allow early elections, probably in September. 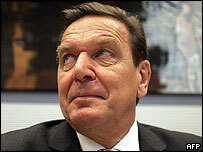 Chancellor Gerhard Schroeder purposely lost a confidence vote on 1 July to pave the way for the early elections, but needed the president's backing. Mr Schroeder's move followed a humiliating loss for his Social Democrats in regional elections in May. The opposition Christian Democrats, led by Angela Merkel, are currently well ahead in opinion polls. Despite the apparent prospect of defeat, Mr Schroeder opted for the early elections to seek a fresh mandate for a controversial reform package. His government has lost much support because of Germany's poor economic performance, high unemployment and the tough welfare reforms it has been trying to push through. On Friday, Mr Schroeder cut short his holiday and returned to Berlin. At a news conference he welcomed the president's move, saying he would fight the election with all his energy. While all the main political parties and the majority of Germans are in favour of early elections, Mr Koehler's decision could be overturned by Germany's highest court, the BBC's Tristana Moore in Berlin says. Several lawmakers have threatened to mount a legal challenge, arguing that an early election is in breach of Germany's constitution, our correspondent says. 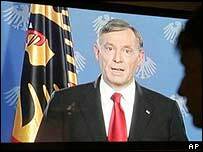 In a televised address, President Koehler said that the poll was most likely to be held on 18 September. Mr Koehler - who holds a largely ceremonial post - said that the chancellor's calls for a new poll one year ahead of the original schedule complied with Germany's constitution. He said the country faced "giant tasks" in attacking its high unemployment and swollen budget deficits. "In this serious situation, our country needs a government that can pursue its goals with steadiness and vigour," the president said. "For this, the federal government requires the support of a reliable majority that is able to function." Recent opinion polls put the Social Democrats about 17 points behind Ms Merkel's Christian Democrats. If Ms Merkel wins, she will become the country's first female chancellor. Which way now for Germany?